Yes it mentions it. Look closely at the video. It says: "Courtesy of U.S. Department of Defense"
No. That video is not "courtesy" of the Department of Defence. It is a video supplied by Harold Puthoff who was in the room with Luis Elizondo. Harold Puthoff has already been running his private UFO chasing company Earth Tech International since 1985. Skeptics already know Harold Puthoff as Yuri Geller's promoter. All that is happening is that the people in the room, none of whom are employed by any government or any defence organisation, are raising money for their new UFO chasing company To the Stars Academy. There is no Dod press release, released video or anything else. Luis Elizondo does not work for the Department of Defense, nor is he their spokesperson. These people are trying to raise money. So your claim is the NYTimes is lying. It seems hard to believe there's an honest mistake involved here. So who to believe, the DoD, or the Times? Did you live through the Pentagon Papers? So your claim is the NYTimes is lying. No. At no point does the New York Times say they met with, received, or saw any press release, from the Department of Defence. The New York Times clearly states their journalist met with private citizens in a hotel room. One of those blokes was Harold Puthoff, who previously promoted Uru Gellar and was already a director of a UFO chasing company called Earth Tech International. So who to believe, the DoD, or the Times? You would believe the DoD who has clearly stated Luis Elizondo does not speak on their behalf and that they never released any video to the public. No. At no point does the New York Times say they met with, received, or saw any press release, from the Department of Defence. I don't think they put "Courtesy of U.S. Department of Defense" to be cute. Why do you think they wrote that? The New York Times clearly states their journalist met with private citizens in a hotel room. One of those blokes was Harold Puthoff, who previously promoted Uru Gellar and was already a director of a UFO chasing company called Earth Tech International. My money's on the Times rather than the DoD. My guess would be that's what the people who gave them the video told them about its provenance. My guess would go further and suggest that wasn't true. While I'm unburdening myself, I might as well add that I think the weird artefact frozen in the middle of the display for most of the video is fakery and won't be on the original. That's possible, but the Times is going out on a limb taking them at their word. The reporting they did on these articles seems pretty thorough. Because there is no official DoD press release, of letter, or statement or anything else that comes from the DoD stating the DoD had released the video. .......so they wrote it themselves. Harold Puthoff has done this before when he claimed to release CIA documents on Uri Geller's remote viewing. These people have form. Well you have a rather large problem. The DoD hasn't actually made any press release of any sort concerning the UFO video. It has been seven days and not one UFO fan has found anything from the DoD related to the video. How about, you drop the claim that the "DoD officially released the video" until you can find a DoD document that says they did. It is simply three private citizens setting up another UFO chasing company that made the claim. It appears that Harold Puthoff previous UFO chasing company Earth Tech International has collapsed. Absolutely 100% agree with this. There is NO DOD press release regarding this video, in fact there is not a single word regarding this video of any kind from the DOD. Those who released the video are no more than mercenary scumbags out to set up yet another UFO chasing organisation to dupe dimwitted Flying Saucer nutjobs and froot-loops out of their hard-earned cash. Its not the first time some of those involved have done this. Just to let you know, there are many things that you cannot find on the D0D website and I know that as a fact. However, let's head on over to Nevada and take a look at the Nellis UFO videos, which were released because as much as I find the Navy's UFO video interesting, I think the Air Force got it beat with its Nellis UFO videos and performance data on the object which was confirmed as a flying craft. Just to let you know, there are many things that you cannot find on the D0D website. That's why the Department of Defense has, what we call a "press officer" and a "media centre". Indeed, guess what service they offer?
" The Department of Defense responds to media requests and queries through our Press Operations Center located in the Pentagon. This link is intended for requests from the media that do not require a response prior to the next business day. Media with queries during our normal business hours should call (703) 697-5131. Now don't you think it is rather entertaining, that the greatest UFO researchers in the world are magically unable to ring the DoD's press centre to ask if they released the video? Just to let you know, there are many things that you cannot find on the D0D website and I know that as a fact. Argument from Authority.. your claim is unevidenced. Last edited by smartcooky; 26th December 2017 at 08:36 PM. We injected plutonium into people and deliberately withheld syphilis cures. Agent Orange, depleted uranium slugs...Who knows what else has gone on we don't know about. I wouldn't put anything past our military. No, we can't, at least not based on your links and cites. You should have notice a mention of one of the Iranian UFO encounter, which documents can be additionally obtained from the National Security Agency, Department of Defense, Defense Intelligence Agency and even from the Department of State under the FOIA. If you don't like references from the Internet, then use the FOIA in order to have official declassified government UFO documents sent to your own home. BTW, you will see a brief mention of the Cuban UFO encounter by two Cuban Mig-21's, which to me was one of the most chilling UFO encounters in recent history. An amazing development surrounding a decade-old report re-emphasized the strong national security nature of the UFO phenomenon. This report is the 1967 Cuban jet incident. The 6947th Security Squadron's mission was to monitor all Cuban Air Force communications and radar transmissions. One hundred of the squadron's men were assigned to Detachment "A," located at Key West Naval Air Station. This forward base against attack from Cuba was on Boca Chica Key, a tropical island in the Florida Keys, east of Key West and about 97 miles from the nearest Cuban coastline. Several of these units were scattered geographically to enable direction-finding equipment to locate fixed or mobile land-based radar sites and communications centers and to plot aircraft movements from flight transmissions. One day in March, 1967, the Spanish-speaking intercept operators of Detachment "A" heard Cuban air defense radar controllers report an unidentified "bogey" approaching Cuba from the northeast. The UFO entered Cuban air space at a height of about 10,000 meters (about 33,000 feet) and sped off at nearly Mach 1 (nearly 660 mph). Two MIG-21 jet fighters were scrambled to meet it. The jets were guided to within five kilometers (three miles) of the UFO by Cuban ground control intercept radar personnel. The flight leader radioed that the object was a bright metallic sphere with no visible markings or appendages. When a try at radio contact failed, Cuban air defense headquarters ordered the flight leader to arm his weapons and destroy the object. The leader reported his radar was locked onto the bogey and his missiles were armed. Seconds later, the wingman screamed to the ground controller that his leader's jet had exploded. When he gained his composure, the wing man radioed there was no smoke or flame, that his leader's MIG-21 had disintegrated. Cuban radar then reported the UFO quickly accelerated and climbed above 30,000 meters (98,000 feet). At last report, it was heading south-southeast towards South America. An Intelligence Spot Report was sent to NSA headquarters, since AFSS and its units are under NSA operational control. Such reports are standard practice in cases of aircraft losses by hostile nations. NSA is required to acknowledge receipt of such reports. But the 6947th's Detachment "A" did not get one; so it sent a follow-up report. And, that wasn't the only time that pilots were lost intercepting UFOs. Just to let you know that video would have not been released without higher approval from the Pentagon. It is not like the pilot can put a video tape in his pocket and walk into any media office and release the video on his own because that is not how the system works. Once again, make a request under the FOIA and you will find that such UFO encounters are very common, not just over the United States, but around the world and yet, you don't read about the thousands of such encounters in newspapers or from the news media. What can you tell me about the 1995 America West UFO encounter? Did you know that ATC and military communication tapes regarding that UFO encounter are available? Last edited by skyeagle409; 26th December 2017 at 09:12 PM. As long as there is approval, there is no problem. After all, my security agreement spells what what would happen to me if I took an unauthorized government video to the press or anyone else. I know how to gather such information, not just under the FOIA, but from government agencies legally. 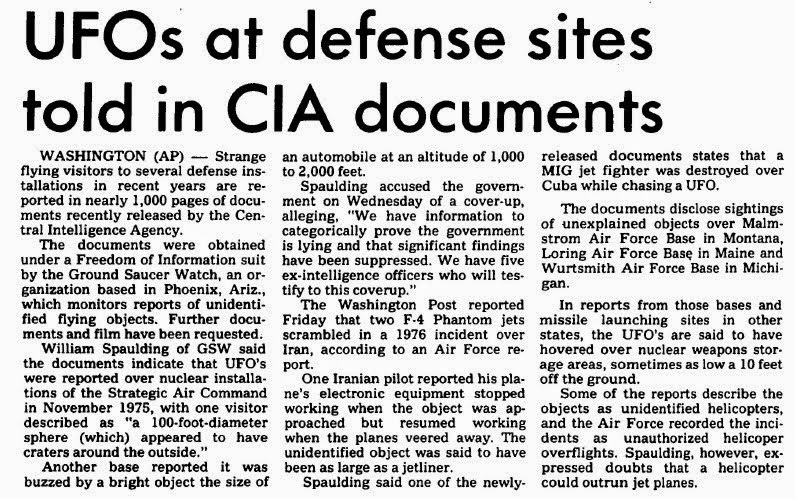 After all, it was the Air Force that supplied me with documentation on Project Mogul that debunked its own 1994 Roswell Report. In fact, the Air Force never mentioned in its 1994 Roswell Report that Project Mogul balloon scientist were tracking flying saucers over New Mexico and in one case, observing UFOs hovering 200 miles above earth. That information came from the balloon teams themselves. You would be surprised at what you can find when you become a real UFO researcher who knows how to obtain declassified government UFO reports and declassified UFO documents that prove we are being visited. The Navy's UFO footage was previously "classified." Releasing classified information can spell prison time. After all, there are valid reasons why certain videos and documents are classified in the first place. Last edited by skyeagle409; 26th December 2017 at 09:32 PM. Of course the government secretly investigates such reports, it's their job. There may be something they need to know about up there (much more probably the products of other countries than other planets, but the latter possibility should certainly be considered). This is not the first time there has been a dedicated programme to do so, nor is it the first time said programme has been wound up after a few years. There is nothing new here. There have been reports of UFOs and mysterious materials with amazing properties for decades. Nothing has ever come of them, and all indications are that nothing will come of the current ones. If it ever does, great; like lionking I would be delighted. But I'm not getting my hopes up. I find this letter interesting. 1. Early in the morning of 27 Dec 80 (approximately 0300L) two USAF security police patrolmen saw unusual lights outside the back gate at RAF Woodbridge. Thinking an aircraft might have crashed or been forced down, they called for permission to go outside the gate to investigate. The individuals reported seeing a strange glowing object in the forest. The object was described as being metallic in appearance and triangular in shape, approximately two to three meters across the base and approximately two meters high. It illuminated the entire forest with a white light. The object itself had a pulsing red light on top and a bank(s) of blue lights underneath. The object was hovering or on legs. As the patrolmen approached the object it maneuvered through the trees and disappeared. At this time the animals on a nearby farm went into a frenzy. The object was briefly sighted approximately an hour later near the back gate. 2. The next day, three depressions 1 1/2″ deep and 7″ in diameter were found where the object had been sighted on the ground. The following night (29 Dec 80) the area was checked for radiation. Beta/Gamma readings of 0.1 milliroentgens were recorded with peak readings in the three depressions and near the center of the triangle formed by the three depressions. A nearby tree had moderate (0.05 – 0.07) readings on the side of the tree facing towards the three depressions. 3. Later in the night a red sun-like object was seen through the trees. It moved about and pulsed. At one point it appeared to throw off glowing particles and then broke into five separate white objects and disappeared. Immediately thereafter, three star like objects were noticed in the sky, two objects to the north and one to the south, all of which were about 10 degrees off of the horizon. The objects moved rapidly in sharp, angular movements and displayed red, green and blue lights. The objects to the north appeared to be elliptical through 8-10 power lens. They then turned to full circles. The objects in the north remained in the sky for an hour or more. The object to the south was visible for two to three hours and beamed down a stream of light from time to time. Numerous individuals, including the undersigned, witnessed the activities in paragraphs 2 and 3. Last edited by skyeagle409; 26th December 2017 at 09:41 PM. I like how it's possible to disparage the DOD as untrustworthy while supplying a steady stream of DOD data. Ah yes, the Rendlesham Forest incident.. I remember it well, I was stationed at RAF Lakeheath at that same time (about 40 miles away further inland) . Scuttlebutt was that what the lads saw was the Orfordness lighthouse. They made the whole UFO story up...things got out of hand quickly and they found themselves unable to retract, so they did the only think they could... double down on the hoax. Just to let you know that video would have not been released without higher approval from the Pentagon. No. You are making these stories up on the spot. The video comes from Luis Elizondo who is trying to raise money for his UFO chasing club. The Pentagon has nothing to do with the video. That would be a real video. It seems to have escaped your attention that the Luis Elizondo only has his edited version and not a full duration recording. You can do what you want. However I saw this fundraising scam before, when Harold Puthoff raised money for Earth Tech International, which also chased UFOs. Puthoff is doing it again with To the Stars Academy. Are you going to buy shares in To the Stars Academy? You claim the USA is about to say UFOs are real......now's your big chance to get really really rich. It's one of my favourite total crap UFO stories. I simply loved the mysterious UFO landing indentations........that were actually rabbit scrappings and all over the entire forest. The best debunk of this story is by a gentleman called Ian Ridpath. I'm starting to doubt every bit of Elizondo's crap story. The first person who would see the UFO on the video would be the post-mission debriefing officer on the Nimitz. That officer would see the entire full length video from all four F-18s, from the second group. However, there was no second group of four F-18s, which supposedly captured this video. Where are those debrief statements? Why does Elizondo only have one video and not the pilots' statement? Where are the four full length HUD videos? "2. The next day, three depressions 1 1/2″ deep and 7″ in diameter were found where the object had been sighted on the ground. The following night (29 Dec 80) the area was checked for radiation. Beta/Gamma readings of 0.1 milliroentgens were recorded with peak readings in the three depressions and near the center of the triangle formed by the three depressions. A nearby tree had moderate (0.05 – 0.07) readings on the side of the tree facing towards the three depressions." Radioactive rabbit scrappings? Again, here is the debunk by Ian Ridpath. It is a very funny and simple debunk. Which doesn't address the point. The claim is that the video was released by the DoD, but there is nothing from the DoD that says the video was released by them. The claim is not that it was leaked by someone at the DoD. If you find evidence its not faked, let me know and I'll take another look. The video I've seen so far has an unidentifiable smudge right in the crosshairs of what looks like a military jet's IR display. As the jet manoeuvres, the smudge remains fixed exactly in place without so much as a wobble. At one point the smudge revolves but again stays firmly in place. Eventually it slides off to the left, out of view. Through all this there is nothing in the audio track to indicate that this odd thing, right in their sights, is the thing the pilots are talking about. Just to let you know that you just told me that you don't know the rest of the story. Had you done further research using the FOIA, you would have found that rabbits had nothing to do with it and that a determination was made the object weight around 8 tons and that is what reallly impressed the government investigators and the object described has also been described in other UFO sightings. Once again, don't just rely on the Internet and let me know how much you don't know. Just use the FOIA to get the rest of the picture of what you did't know!! Declassified govenment documents will tell the rest of the story. Last edited by skyeagle409; 27th December 2017 at 02:50 PM. Just to let you know that you just told me that you don't know the rest of the story. No Son. I know the entire story. The three indentations from "landing gear of a UFO" were actually just rabbit scrappings. Not only is the forest covered in the same rabbit scrappings back then, but it is still covered in them today. No one has sent the rabbits a "freedom of Information" request. Sadly you are making this new story up on the spot. If the rabbit scraping indentations were radioactive at the time, as you claimed, they would still be radioactive today, but magically the UK EPA found no evidence of radioactivity at all. You didn't know that did you? There is no such magical report. You made this up on the spot. Show us that report and the number of landing legs. SkyEagle will now tell us how these rabbit scraping photos indicate. eight ton rabbits. One photo is meant to be a UFO landing indentation. Now you directly lied and made up that "fact" on the spot, didn't you? The "landing pad indentation" ( In reality a rabbit scraping) is 1.5 inches deep (38mm) and 7 inches (177mm) in diameter. Do you think 8 metric tons, resting on soft soil, on the surface area of a small pie plate is only going to sink 38mm? Those were not rabbit scraping as the depressions formed a perfect triangle and not only were there was moderate radiation readings near the landing site, the highest radiation readings were at the tri-pod depressions, which were above typical radiation readings. Plaster was used in the depressions which once again, was where the highest radiation readings were recorded. BTW, I wouldn’t use Ian Ridpath as a reference. He has been debunked time and time again. Ask him what caught the attention of USAF security at the East gate that gave them a reason to conduct an investigation into the forest and if says anything about a lighthouse then my case will be proven that he has no credibity in the Rendlesham case because I had to go out of my way to produce photos from the East gate area to prove that it was impossible to see the lighthouse from the East gate. 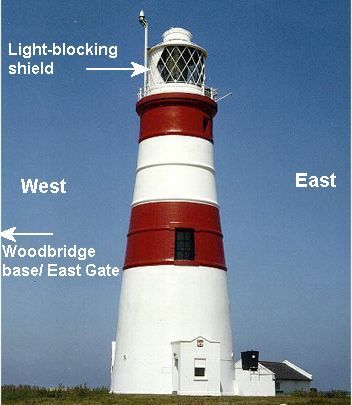 In fact, the lighthouse in question also had a light-blocking panel between the light source and the base. I put him in the same boat as UFO skeptic Tim Printy for whom I had some heated discussions over Roswell and thanks to what I knew about Roswell and the involvement of the C-54 in that case, he was forced to make a correction on his own website. All he had to do was to do some research. On another note, my assistant on an Air Force contract at Travis AFB, CA. was at RAF Bentwaters during the Rendlesham incident and he provided further information on events that occurred, and I might add that there multiple nights involving UFOs. I might also add that UFOs made a big hit near the area in 1956. Last edited by skyeagle409; 27th December 2017 at 10:27 PM. Initially I thought you were referring to the Socorro UFO landing case where tripod depressions were examined. That was another UFO landing case that impressed the U.S. government. "The next day, three depressions 1 1/2″ deep and 7″ in diameter were found where the object had been sighted on the ground. The following night (29 Dec 80) the area was checked for radiation. Beta/Gamma readings of 0.1 milliroentgens were recorded with peak readings in the three depressions and near the center of the triangle formed by the three depressions." Sooooooo....Skyeagle409? What is the radiation levels of the rabbit scrappings today? As a leading UFO "researcher" did you check this? 1)Tell me what this reading was again in comparison to normal expected back ground readings? 2) Do you know what radioactive half life means? If so why isn't the site still radioactive? I wonder if his motivation is similar to those that conduct pious fraud? Initially I thought you were referring to the Socorro UFO landing case where tripod depressions were examined. You are digging yourself into a deeper hole. Are you now agreeing that the Rendlesham UFO actually weighed as much as a normal forest rabbit and that's why the indentations are only 38mm deep? STOP PRESS : MUFON makes big announcement. What can you tell us about the UFO Lakenheath incidents of 1956? Scuttlebutt was that what the lads saw was the Orfordness lighthouse. Not from the East gate! In addition, Inwent out my way to provide photo evidence that it was impossible to see the lighthouse from the East gate, not to mention that my assist on an Air Force also confirmed the lighthouse cannot seen from the East gate and to further add, the lighthouse has a light-blocking panel facing the base. How long has that lighthouse been in operation? Any similar reports from the East gate before the 1980 incidents? 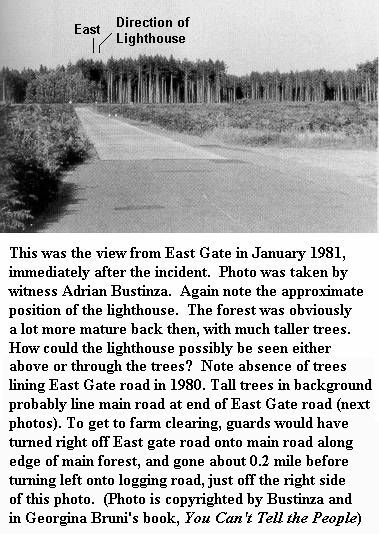 If not, then you have some explaining to do considering Air Force personnel were long aware of that lighthouse yet no reports in the forest from the East gate on the level of the Rendlesham case. Please explain that. they found themselves unable to retract, so they did the only think they could... double down on the hoax. That is completely false and I know that as a fact. Explain why the British MoD sought to cover up the Rendlesham case. Ask them about Col. Halt’s memo. I have, over the years, warned UFO skeptics about those skepticle websites. One UFO skeptic in another Roswell forum was using Tim Printy’s website in his argument against me. He soon tired of my repeated debunking of Tim’s website and personally contacted Tim and brought Tim into the burning frying pan and when the smoke cleared, Tim Printy was forced to make a correction on his own website after I presented evidence that he was barking up the wrong tree. Last edited by skyeagle409; 27th December 2017 at 11:56 PM. That won’t work and I very sure that radioactive rabbits with measuring tapes were responsible for the higher radiation readings within the precise triangular arrangement. Don’t follow Ian Ridpath or Tim Printy’s false path to a dead-end street. BTW, who is Kevin Corde? Last edited by skyeagle409; 27th December 2017 at 11:53 PM.